MADISON, Wis. (AP) — Demonstrators booed outgoing Wisconsin Gov. 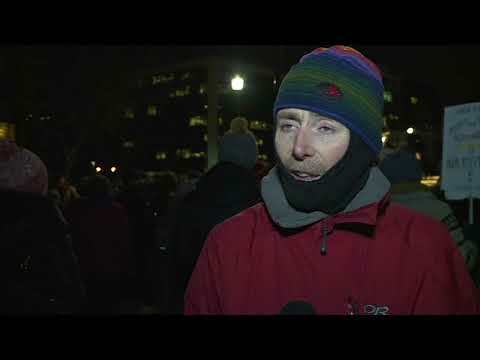 Scott Walker on Tuesday during a Christmas tree-lighting ceremony, a sign of tumult as Republicans in the Legislature met to push through measures to gut the powers of his Democratic successor. The Legislature met deep into the night Tuesday to pass a series of bills, first unveiled Friday, that would weaken the governor’s office and transfer power away from the Democratic-elect attorney general and give it to the Legislature. The Legislature wasn’t expected to complete its work until early Wednesday morning. Walker has signaled support, but he couldn’t escape anger over the rare lame-duck session even during what is normally an upbeat holiday tradition. Stung by their election loss last month, Republicans treated the lame-duck session as a final opportunity to use their political clout to weaken the next governor before time runs out. Democrats, who won every statewide constitutional office after nearly a decade-long GOP hold on power, derided the session as a cynical attempt to preserve the party’s waning strength. The fact that Walker was making no attempt to halt the effort “clearly indicates he wants to be able to control things outside the governor’s office for the next four or eight years,” Hahn said. Republicans were still working to reach final agreement on what exactly they would pass. Leaders from both the Senate and Assembly negotiated into the night, giving opponents hope that the bills may be scaled back. Debate in the Assembly finally began around 10:30 p.m., more than nine hours after it was scheduled to start. At one point Tuesday, the public was ordered removed from Senate galleries after repeated warnings to be quiet. Spectators shouted “Shame!” and hurled complaints at senators, temporarily halting debate. Less than an hour later, Republicans let people back in. The GOP proposals would weaken the governor’s ability to put in place rules that enact laws and shield the state jobs agency from his control. Republicans also want to limit early voting to no more than two weeks before an election. The Senate passed one measure, on a party-line vote, to enact Medicaid work requirement rules Walker recently won a federal waiver to establish. The bill would also give the Legislature oversight over the governor seeking future waivers for health care, a change Democrats said would handcuff the new administration. The Wisconsin GOP package would also weaken the attorney general’s office by allowing Republican legislative leaders to intervene in cases and hire their own attorneys. A legislative committee, rather than the attorney general, would have to sign off on withdrawing from federal lawsuits. That would stop Gov.-elect Tony Evers and Attorney General-elect Josh Kaul from fulfilling their campaign promises to withdraw Wisconsin from a multi-state lawsuit seeking repeal of the Affordable Care Act. They made opposition to that lawsuit a central part of both of their campaigns. Some hinted at filibusters or legal challenges and called the lame-duck session “illegitimate.” Former Democratic attorney general and Gov. Jim Doyle said the moves were unconstitutional. Never in Wisconsin history “has an extraordinary session been used to deny the will of the people and take away powers from the newly elected governor and newly elected attorney general,” Democratic Rep. Chris Taylor said. Despite the victories by Evers, Kaul and other Democrats, the party gained no ground in the Legislature and blamed partisan gerrymandering by Republicans for stacking the electoral map against them. Republican Assembly Speaker Robin Vos told reporters that his constituents want him to protect everything the GOP has accomplished over the last eight years under Walker. The legislation, he said, ensures that Evers will have to negotiate with lawmakers and cannot unilaterally erase Republican ideas. “We do not believe any one individual should have the opportunity to come in and with a stroke of the pen ... eliminate laws passed by our Legislature,” Vos said, citing rules enacting voter photo ID, a key GOP initiative during Walker’s two terms. The last lame-duck session in Wisconsin was in 2010, when Democrats tried unsuccessfully to enact labor agreements. The proposals to bolster Republican legislative power come after North Carolina lawmakers took similar steps two years ago. Michigan Republicans are also discussing taking action before a Democratic governor takes over there. Opponents have said many of the changes will likely be challenged in court, a process that could create even more gridlock in state government next year.